If I had to name one grape varietal defining the Santa Cruz Mountains AVA in Northern California, it would be pinot noir. There are as many variables to growing Pinot as there are soil varieties, microclimates and vineyards in this mountainous region. You’ll find elegant, refined Pinots and powerful, bold ones too. In fact you could call this AVA a Pinot Paradise – which happens to be the name of the annual event sponsored by the Santa Cruz Mountains Winegrowers Association. I’ve been spending a lot of time in the region lately, and three Pinot producers I visited are doing exciting things with the grape, from innovations in viticulture and vinification to how each vintner expresses the particular terroir of his vineyards in the Santa Cruz Mountains. Spending time with Kevin Harvey, proprietor of Rhys Vineyards, is like getting a master class in growing pinot noir. “What I notice in Santa Cruz Mountains wines,” says Harvey, a self-confessed Burgundy aficionado, “is the wines have a lot of minerality and that’s what attracts me because that’s what Pinot’s all about — expression of site.” In the short time that Rhys has been producing wine (first commercial release in 2006) the winery has become known for creating some of the most terroir driven wines in the AVA. That’s why Harvey’s so obsessive about soils. “The idea behind Rhys was to have each vineyard be on a completely different geology,” he says. We’re standing on Skyline Vineyard at an elevation of 2,300 ft. Skyline is super rocky, with a thin layer of clay topsoil. “You can tell just by looking at it it’s really mineral-rich and very diverse and complicated. There’s shale, mudstones, sandstone and limestone — all of that is in this one hill,” Harvey says. 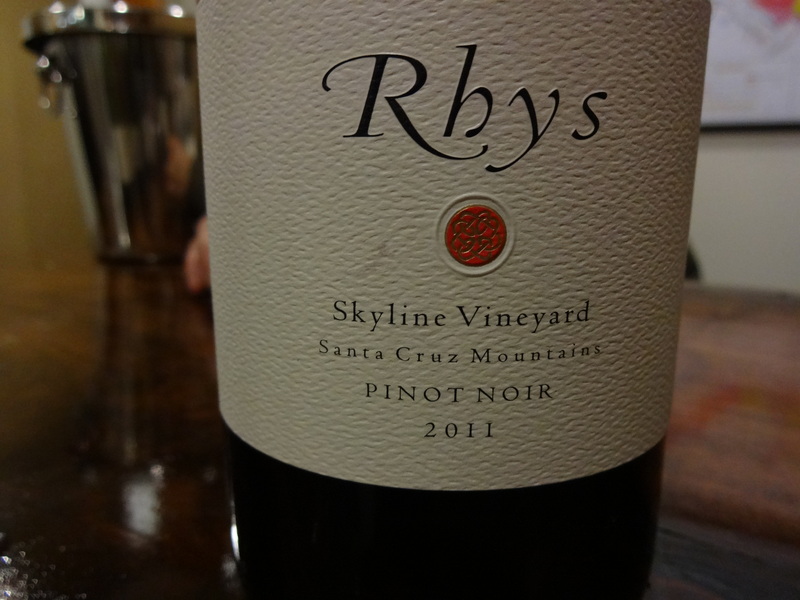 Pinots from Skyline are rich and spicy, with ripe fruit and elegant tannins. Harvey planted all of the Rhys vineyards, “virgin vineyards” he likes to call them. Alpine and Horseshoe Vineyards are a mere 300 yards apart, with similar microclimates and at roughly 1,600 ft elevation. The soils couldn’t be more different, and that affords Harvey the perfect opportunity to showcase the distinct and varied terroir within the AVA. 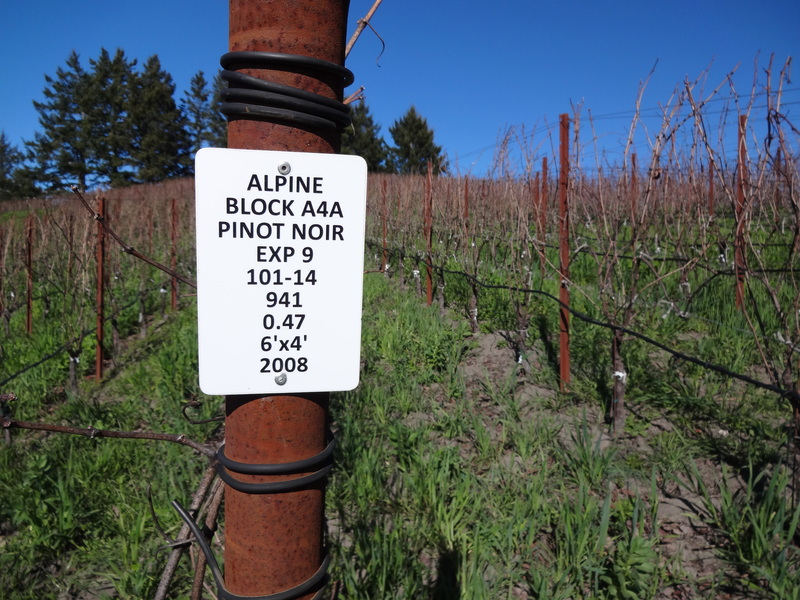 Alpine’s soil is a dense, chalky white shale, making a more fruit forward, “generous and outgoing” Pinot Noir. Horseshoe has brittle soil. It too is white shale, but is “very rigid and like balsa wood it has no weight or density,” says Harvey. “You can see the difference in vigor. The vines are much more vigorous at Alpine. Here at Horseshoe the soil is even rockier, so less vigorous vines that have to struggle even more.” The result is a wine that is very minerally, structured and austere. Driving up to Muns Vineyard means navigating a twisting, climbing road with hairpin turns and steep drop offs. 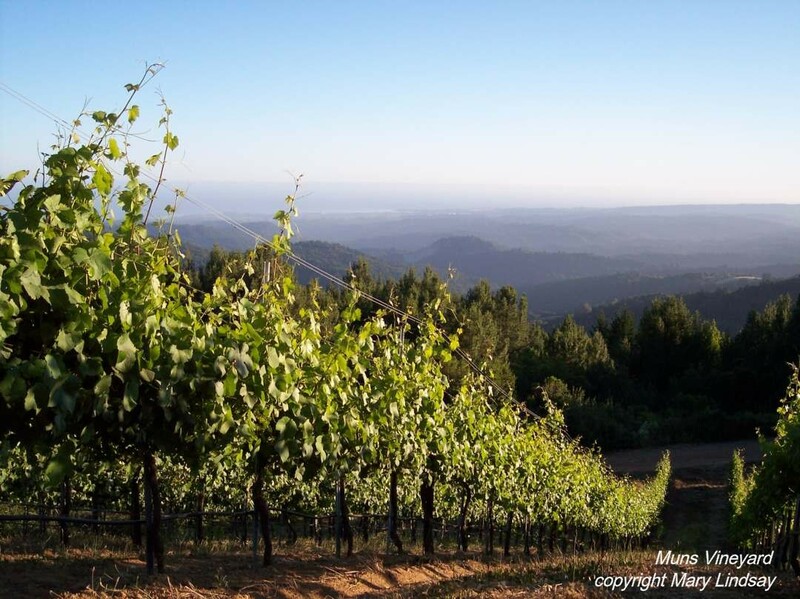 At 2,600 feet Muns is the highest Pinot Noir vineyard in the Santa Cruz Mountains AVA, with 360 degree views encompassing Santa Cruz, Monterey Bay and Loma Prieta. It’s one of the most remote vineyards in the appellation; there’s not even a tasting room or winery on site. Just 13 acres of vineyards, 12 planted to pinot and one to syrah. 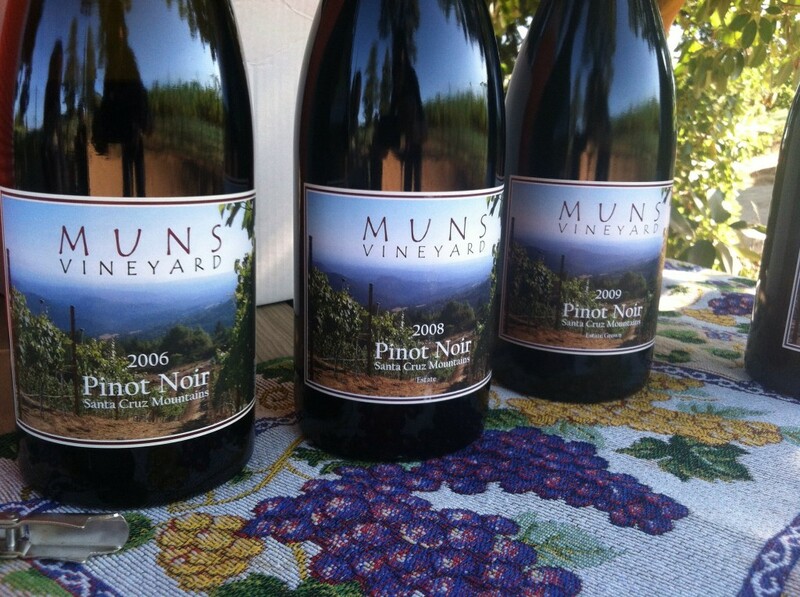 Muns is also one of the newer kids on the block, but already earning praise for its elegant and distinctive wine. Owners Ed Muns and Mary Lindsay are self-taught grape growers who decided to revitalize the abandoned vineyard on their property in 1998. 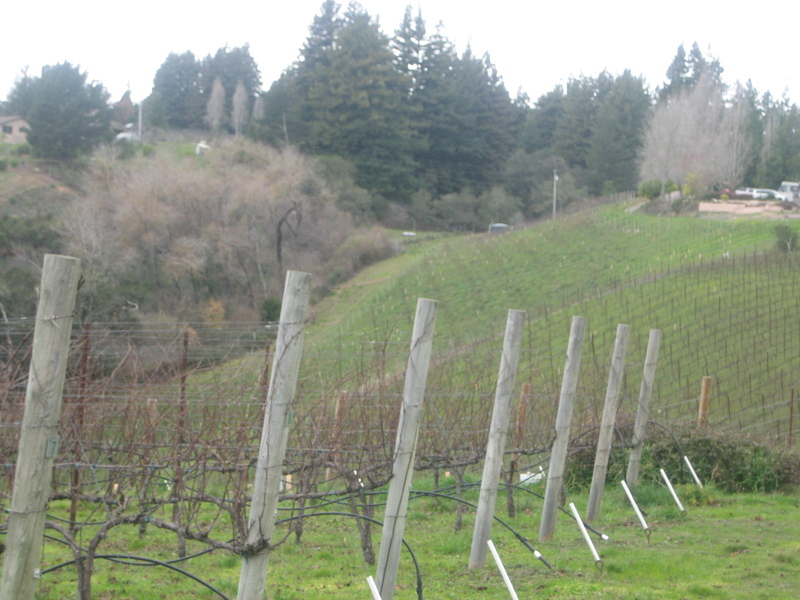 Muns sells most of its grapes to other wineries in the Santa Cruz Mountains, including Thomas Fogarty, Beauregard, Silver Mountain and Sonnet who make Muns Vineyard designate Pinots. Lindsay says a friend in the industry convince them to bottle their own label, which they started to do in 2006. When Muns makes its own wine they really let the fruit shine. Winemaker Tony Craig uses Hungarian oak which isn’t as heavy on the wine as French or American oak, and the Muns Pinots are soft and velvety. Because the vineyard is above the fog line, the grapes get sun most of the day, but there’s a big temperature drop at night, 30 to 40 degrees, keeping the acidity up. The wines show great aging potential, as in the 2006 Pinot, which is still fresh, has a beautiful floral nose (rose, violet) and nice mineral notes, something I taste in all the Muns wines. I’m on a gator, cruising through the Windy Oaks vineyards, climbing up a high ridge in the middle of Pinot Noir vineyards with owner and winemaker Jim Schultze. At the top we’re overlooking 15 acres, 14 of them planted to pinot and one to chardonnay. We can see Monterey Bay and the Monterey Peninsula, but at an elevation of 1,000 ft. we are above the fog line. “It’s a great site for Pinot Noir, very consistent from year to year,” says Schultze, and high acidity is a hallmark of all Windy Oaks wines. Another hallmark is the wide range of Pinots Schultze produces, seven in total including blends, single vineyard and whole cluster fermented. Windy Oaks is in Corralitos, at the southern end of the Santa Cruz Mountains AVA. “Corralitos is continuing to grow in kind of a recognition of being such a great cool climate growing area,” says Schultze. What difference does all that make in the glass? 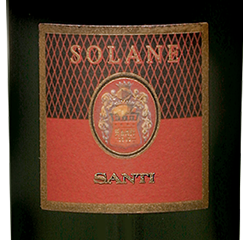 Super smooth velvety wines that have ripe red fruit, and are elegant and complex, with an underlying earthy note. The Pinots of Rhys, Muns and Windy Oaks are all small production wines, so it’s not an easy feat to get your hands on a couple bottles. Rhys makes about 8,000 cases per year and sells primarily to its mailing list which usually sells out. Muns makes less than 300 cases a year, but you do see the wines in several local Santa Cruz Mountains restaurants, wine bars and specialty grocers. At about 3,000 cases, Windy Oaks may be the easiest wine to find. It’s the only winery of the three to have a tasting room open to the public, open on Saturdays. But if you are looking for wines that are a true expression of the complex and varied terroir of the Santa Cruz Mountains then these wines are worth seeking out.